​David Byrne did it, and now nine Manitoba artists are turning neuroscience into art. David Byrne did it — and now nine Manitoba artists are turning neuroscience into art. The art exhibit Neurocraft opens Friday night at the John Buhler Research Centre, attached to Winnipeg's Health Sciences Centre. It features the work of artists who were paired up with neuroscientists to create works inspired by the brain. Artist Heather Komus went to an autopsy to watch a brain being sliced open. 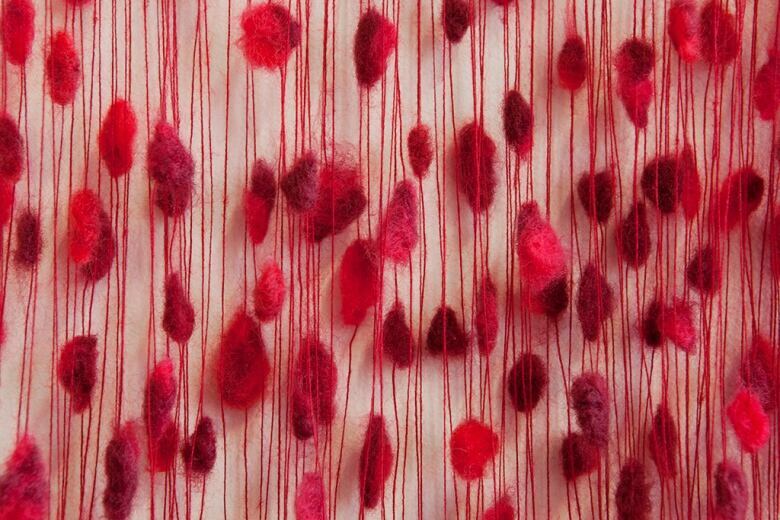 "I was just really inspired by the physicality of the brain — seeing the blood and the texture and also how the brain could be damaged," said Komus. "I've always been fascinated by blastomycosis, which is an infectious fungi that affects the body and the brain." So Komus collected and dehydrated more than 70 mushrooms, arranging them in roughly the shape of a brain and installing them on the wall of the research centre's atrium. The project began when the Manitoba Neuroscience Network reached out to the Manitoba Craft Council to help them present their research materials to the public. They were inspired by American efforts to combine art and science, like former Talking Heads frontman David Byrne's recent collaboration with 15 neuroscience labs, in which he re-created experiments in an art gallery. The neuroscientists network here tapped the University of Manitoba's Seema Goel to curate the exhibit, and she said artists "jumped" at the chance to get access to labs typically hidden from public view. The show is a chance to explore neuroscience without "all the weight of the scientific terms and the technical jargon, and maybe the fear," Goel said. "The range of materials being used makes the whole show very accessible." Dana Kletke, Heather Komus, Ash Alberg, Chantel Mierau, Lesley Nakonechny, Ann Stinner, Gaëtanne Sylvester, Peter Tittenberger and Michelle Wilson all contributed work. Tabrez Siddiqui, a neuroscientist with the HSC's Kleysen Institute for Advanced Medicine, was paired with artist Ann Stinner. Siddiqui studies how nerve cell connections form, how they change and how they function in people with mental health disorders. "She sat down over the microscope and looked at slides of nerve cells we grow on dishes," said Siddiqui. 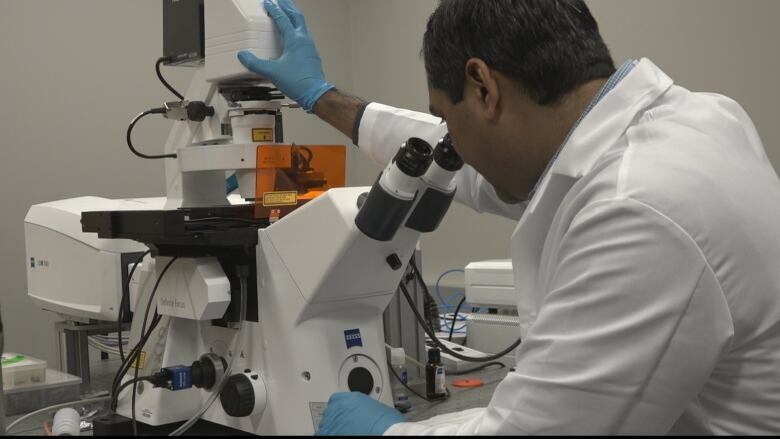 Tabrez Siddiqui is a neuroscientist with the Kleysen Institute for Advanced Medicine who studies nerve cell connections. He collaborated with artist Ann Stinner for the Neurocraft exhibit. (CBC)Siddiqui almost ended up in the arts himself. He's written and published several plays, as well as poetry. "I think there are things that we can see through art that we may not be able to see through empirical science," said Siddiqui. "It enables scientists to view their own work in a different angle. It's a different approach to looking at scientific problems. It opens up communication with the wider public." And, Siddiqui said, it's beautiful. "I mean, if you look at the drawings Ann did for us, she has been able to observe some patterns of the way neurons are growing on dishes and the ways cells are arranged," he said. "The brain is very beautiful, and the artists are able to make us look at it." Goel co-ordinates a program at the University of Manitoba that connects students across disciplines to make art that connects to the sciences. "I don't feel that art and science are disconnected," said Goel. "The sciences and the arts have so much in common in terms of process. They're rigorous, they take practice. They understand that trial is not the same thing as failure … Real science and real art are very, very open and they're full of questions." The show opens March 3 at 7 p.m. and runs until March 31.